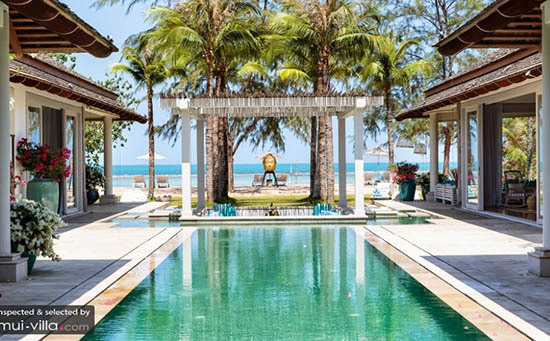 Elegant and luxurious, Villa Baan Hansa is a classic beauty sitting along the southwestern coasts of Samui. 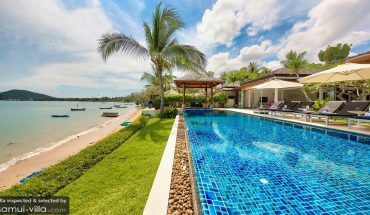 This stunning vacation rental is a hard one to beat, for it ticks all the right boxes when it comes to offering excellent villa features. Beachfront location? Check. 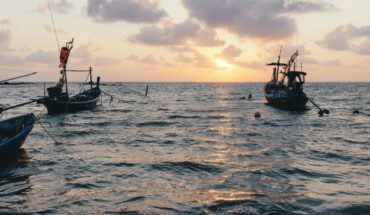 Unobstructed vistas of the ocean? Check. Gorgeous Interiors? Top-notch facilities? Impeccable service? Check, check, check. In addition to these luxuries, guests at Villa Baan Hansa are provided with access to the Intercontinental Hotel situated close by. We offer just one advice – be sure to make a beeline for the fantastic spa amenities available at the hotel! Trust us when we say that Villa Mia is a dream vacation abode. 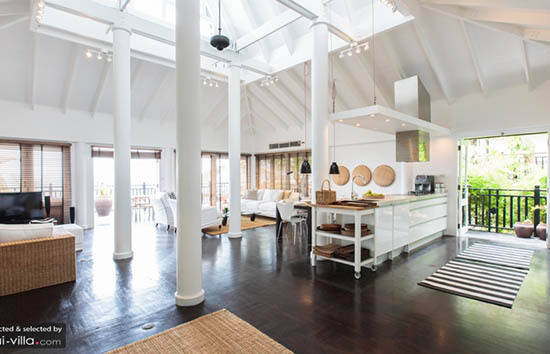 The villa boasts stunning interiors containing a perfect blend of modern and traditional design elements. The stylish furnishings and neutral colour palette lend a contemporary vibe, while quaint Oriental ornaments add a traditional touch to the villa. It is hard to venture out from this captivating vacation home, but we recommend that you spend time outdoors, for Villa Mia is enveloped by picturesque scenery. Our favourite spot to lounge outdoors is the charming massage sala. Inhale the seabreeze, take in the ocean views and enjoy soothing kneads executed by a professional therapist…does this not sound like a perfect way to spend a lazy afternoon? Guests will be spoilt during their stay at the striking Villa Michaela, for there is plenty to see and do at this alluring vacation abode. Sun lovers will enjoy lounging outdoors in the sparkling infinity pool, or on the spacious pool terrace. Holidaymakers who prefer spending their time in the cool interiors of the villa may laze about in the mezzanine den, play a game in the billiard room or embark on a movie marathon in the impressive home cinema. Do not miss out on enjoying a pampering spa treatment in the outdoor spa area located in the garden. Nestled amidst tropical greenery, the well-equipped spa contains a massage room and steam room, offering travellers with the perfect setting to unwind and relax. 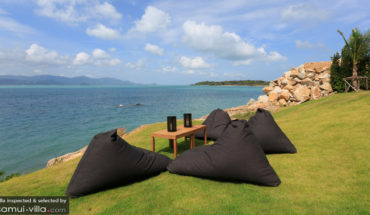 You know that you are guaranteed a delightful stay when you take your first step into Villa Riva Samui. Modern and homely, the cosy interiors of the villa will set you at ease immediately. Apart from providing a restful environment, the villa also boasts a marvellous array of luxurious amentities, such as a fitness room, spacious Jacuzzi tub, dry sauna room, steam sauna and massage room. Give yourself a well-deserved treat, and put these facilities to good use by enjoying lengthy massage and spa treatments during your stay at Villa Riva Samui! Providing a wealth of indulgent spa treatments is a very serious business at Samui Ridgeway Villa. This can be discerned from the variety of spa facilities and services that the villa and its staff provides. A dedicated Spa Villa sits amidst the spacious compounds, offering guests with a private setting to enjoy a wide range of spa and massage services. 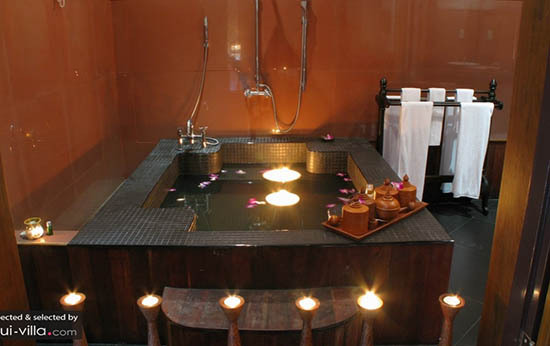 Taking a good soak in the bathtub is a pleasurable experience in this villa, for tea lights are placed around the room to provide a warm, amber glow, while the aromatic scent of essential oils wafting in the air promises to soothe and relax. 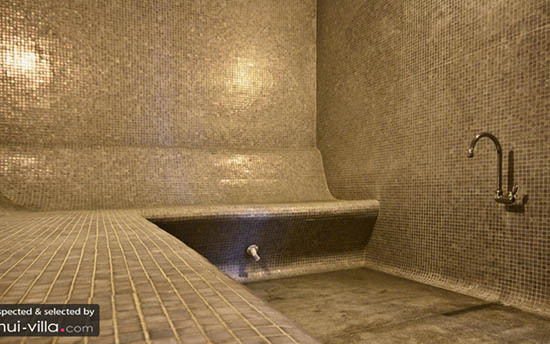 In addition to spa amenities at the Spa Villa, Samui Ridgeway Villa also boasts two spa suites. Decked in bright and cheery colours, these spa suites feature luxurious Vichy beds in its gorgeous bathrooms. 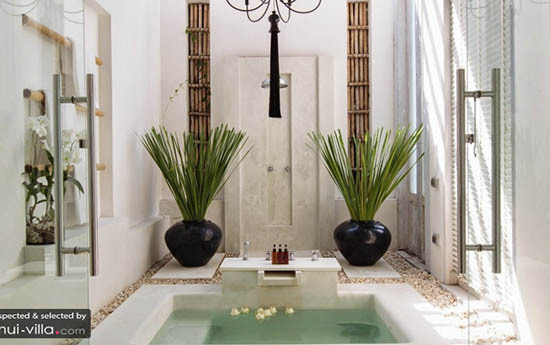 Lucky guests occupying these suites can enjoy a rejuvenating water massage at any moment during their stay in the villa.